Team McCullough Construction just competed in its 3rd JDRF Real Estate Games to benefit Type 1 Diabetes research. Every summer (over the last 29 years), Commercial Real Estate companies, General Contractors, Subcontractors and Construction Companies from all over MD, DC & VA come together to raise money for this great cause and have a great time showing off our fun & competitive sides. Although we are a smaller GC with not as many members on our team as some of the competition, McCullough still managed to win 1st place in 2 separate events this year! Congratulations to Adam Erdley for crushing the Heads of Office Challenge and to Robert Copeland for bringing home the win for the Noodle Javelin Throw. Way to go Team McCullough!! Adam Singer of Savills Studley, Inc. and a member of the JDRF Board of Chancellors and Rick Kimball founded the JDRF Real Estate Games in 1989 and hosted the first annual event on July 20, 1990 at Gonzaga College High School. 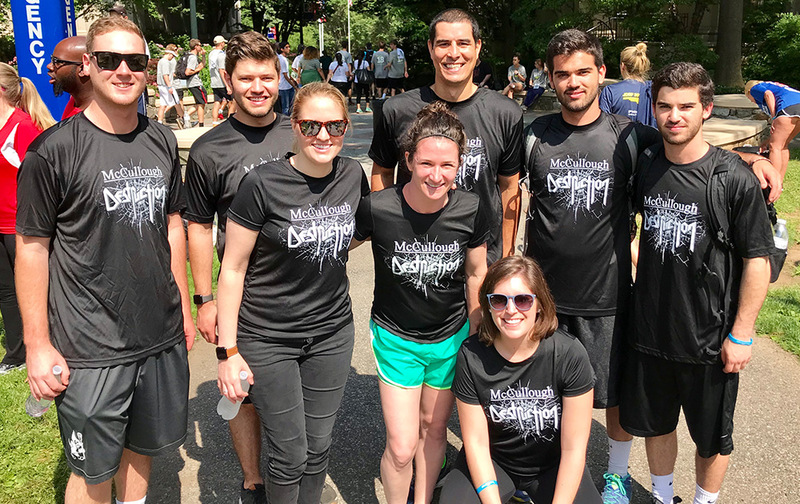 The ’90 Games gained support from 23 real estate brokerage and development firms, 200 participants and 38 volunteers to raise $28,000 for type 1 diabetes (T1D) research. 29 years later, the event has grown exponentially with the support of over 130 companies, 2,500 participants and 200 volunteers raising more than $500,000 annually. Since its establishment, the JDRF Real Estate Games has raised over $6 million for T1D research. JDRF is the leading global organization focused on T1D research. JDRF’s goal is to progressively remove the impact of T1D from people’s lives until we achieve a world without T1D. JDRF collaborates with a wide spectrum of partners and is the only organization with the scientific resources, policy influence and a working plan to bring life-changing therapies from the lab to the community. As the largest charitable supporter of T1D research, JDRF is currently sponsoring $450 million in charitable research in 17 countries. To learn more about their research programs, please visit www.jdrf.org/theplan.